JACOB MARON AND HIS WIFE ELIZABETH AND INFANT SON EMIL HAD LEFT FOR AMERICA IN 1909. WHILE IN LIVERPOOL SHE FELL AND DIED FROM A HAEMORRHAGE. JACOB AND HIS INFANT SON MADE THE JOURNEY ALONE IN 1910. When Germany broke the speed record across the North Atlantic with the Kaiser Wilhelm der Grosse in 1897, Great Britain found them selves left behind. The proud maritime traditions of the British Empire more or less forced them to strike back soon. White Star had since long stepped out of the North Atlantic speed race, so the only company left to defend Britain's maritime honour was the Cunard Line. But they did not have the money to compete. However, Cunard's chairman Lord Inverclyde soon found a solution. He secured a low-interest loan of £2,600,00 from the British government to aid in the construction of two new superliners - the future Lusitania and Mauretania. The government made two conditions, though. First of all, these two new ships would have to be fast enough to win back the Blue Riband from the Germans. Second, they would be constructed in a way so that they in the event of war could be converted into armed merchant cruisers. The Carmania and her sister represented a new style in ocean liner design. 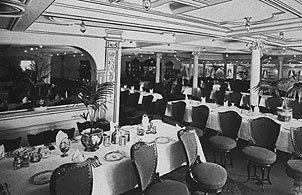 The Carmania was decorated in accordance with Cunard tradition, offering comforts and amenities of high class. When the plans for these new liners began to form, it became clear that they were to become both the largest and the fastest ships in the world. But it was not yet clear how they would be able to reach the 24.5-knot average speed required. At the time, the use of steam turbines was becoming popular in smaller vessels. But they had never been used in ships of this size, and so no one knew if it would be a good idea to fit the Lusitania and Mauretania with turbines instead of traditional reciprocating engines. Cunard soon came up with a way to answer this tough question. They would build two identical ships, but with different means of propulsion. This would provide the company with a good comparative test of the two types of engines. To make everything as equal as possible, the two ships would be built by the same shipyard - John Brown & Co. Ltd. The first of the two ships, the Caronia, was fitted with the traditional type of reciprocating engines. She was launched on July 13th, 1904 and set out on her maiden voyage on February 25th 1905, four days after her sister - Carmania - had been launched. February 21st, 1905, was a day of great public interest. The Carmania was reported to be the forerunner of a new class of giant liners designed to retrieve the Blue Riband, and many had gathered to witness her launch. After having been fitted out, the Carmania was ready for her sea trials. At this early stage of her life she gave clear evidence of the reliability of steam turbines by exceeding her sister's top speed by over two knots. The two sisters Caronia and Carmania represented a new stage in ship design in the Cunard Fleet. Earlier, the funnels had been divided into five equal parts where one fifth was painted black and the other four in Cunard's familiar orange-red colour. But on the Caronia and Carmania the ship's proportions had changed and so the funnels were instead divided into four parts, with the top quarter painted black. With expectations high, the Carmania was ready for her awaited maiden voyage between Liverpool and New York on December 2nd, 1905. Several engineers were on board the new ship to supervise the performance of her turbines during the crossing. Upon the Carmania's arrival in New York a few days later, they were all pleased to report that the engines had worked splendidly. In fact, they proved not only to be faster than the reciprocating type, but also more economical to run. The question of the Lusitania's and Mauretania's engines had once and for all been answered - they would both be powered by turbines. Through the following years, Caronia and Carmania maintained Cunard's Liverpool-New York service and were joined by the new Lusitania and Mauretania in 1907. As expected, their turbines gave them the speed to beat the Germans. In 1910, the Carmania got her first taste of bad luck when a fire broke out on board the ship while at its dock in Liverpool. The fire brigade was soon on the job, but it took them some time to fight the blaze. When finally extinguished, the fire had caused great damage. Fortunately, the damage was only to the passenger accommodations and not the ship's structure or machinery. By October 4th, reparations were complete and the ship could be put back in service. In August the following year, World War I broke out. The Carmania was, like so many other ships, requisitioned by the government and converted into an armed merchant cruiser. This use of the great liners was soon to be proven unsuitable, but the Carmania was one of the few ships that made good use in this guise. In September of 1914, under the command of Royal Navy Captain Noel Grant, the Carmania intercepted the Hamburg-Amerika liner Cap Trafalgar, also converted and armed, in the waters off Trinidad. A fierce battle took place and although the Carmania's bridge caught fire, she managed to keep firing at the Cap Trafalgar. After an hour of fighting, the Cap Trafalgar took on a list and then went down at the head. The Carmania had received a total of 79 hits, and seven crewmembers were lost in the battle. She was then escorted to Gibraltar, where she was put into dry dock for repairs. The Carmania was ready for service again on November 23rd. The ship patrolled the coast of Portugal and the Atlantic Islands until May of 1915, when she was called in to assist in the Gallipoli campaign in the Mediterranean. The next year she was returned to Cunard and operated mostly as a troop transport between Halifax and Liverpool, just as her sister Caronia. When the Great War finally came to an end, the Carmania and Caronia were kept on to return Canadian soldiers to their home country. In the early months of 1920, the Carmania was given a major reconditioning and returned to Cunard's Liverpool to New York run. In 1923 she again had a refit during which her passenger accommodations were reduced to 1,440 people, mainly to make her suitable as a winter-month cruise ship. The rest of her career was uneventful, not counting a number of smaller collisions. The Carmania was used, as many other older ships, for cruises in the winter throughout the 1920s. But the Great Crash of 1929 made times worse for the shipping companies. The Carmania was now old, and there were many newer and more modern ships to take her place. And so, in March 1932, she was sold to the shipbreaking firm of Hughes Bocklow & Co. She was subsequently scrapped at Blyth. A first: Cunard introduced the first steam turbine engines in a passenger liner (Carmania, 1905). "The Carmania and its sister ship, the Caronia, entered service for Cunard in 1905 and at the time they were the largest ships in the Cunard fleet. Following an examination of the merits of different propulsion units one, the Carmania, was fitted with steam turbines and the other, the Caronia, was fitted with quadruple-expansion engines. "The Carmania was launched on 21 February Lady Blythswood, the wife of a former aide to Queen Victoria. The fact that the Carmania was reported to be the forerunner of a larger turbine ship, the Lusitania, was of great public interest. It made its maiden voyage from Liverpool to New York, via Queenstown, on 2 December 1905. Several engineering experts had been on board the Carmania during its maiden voyage and were enthusiastic about how the engines had worked smoothly and efficiently. The ship was powered by three direct acting Parsons steam turbines. "The Carmania continued to operate the New York service without major incident for some years. In June 1910, whilst the ship was in dock at Liverpool, a fire broke out which took the fire brigade some time to extinguish. Although the damage was quite considerable, it was only to the passenger accommodation, and the structure and machinery were undamaged. It was 4 October before repairs had been completed and the ship could return to service. 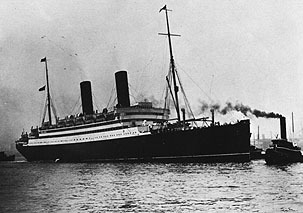 "In October 1913, whilst traveling from New York to Liverpool, it received an SOS call from the emigrant ship Volturno, of the Canadian Northern Steamship Co. Ltd. The Volturno had been travelling from Rotterdam to America with emigrants and a cargo of barium oxide, which had broken loose in gales and caused a fire. The Carmania, under Captain Barr, reached the scene 4 hours after receiving the signal. The ship was forced to stand-by all night as the weather was so severe. The next day the Carmania, and several smaller vessels that had come, picked up the survivors. 103 passengers and 30 crew from the Volturno were lost. Several awards for gallantry were made to the crew of the Carmania. "After the outbreak of World War I the Carmania was requisitioned by the government and converted into an Armed Merchant Cruiser. Under the command of Captain Noel Grant RN the ship sailed from Liverpool and arrived at Shell Bay in Bermuda on 23 August 1914. A German ship, formerly of the Hamburg-America Line, the Cap Trafalgar, had been reported in the vicinity but was believed to be headed for South Africa. The ship, however, had been armed and was patrolling around Trinidad. On the morning of 14 September the Carmania engaged the Cap Trafalgar. Despite having to abandon the bridge of the ship, due to fire, the crew of the Carmania continued to fire on the German ship. The Cap Trafalgar began to list and went down bows first. The battle had lasted nearly one hour. The Carmania was potted with holes from Cap Trafalgar's bombardment, and had lost 7 men in the action. The ship was then escorted to Gibraltar and placed in dry dock. "By 23 November repairs were complete. Until May 1915 the ship patrolled the coast of Portugal and the Atlantic Islands, but was afterwards required to assist in the Gallipoli campaign. It also assisted in quelling a mutiny on board the British steamship Maristan. In May 1916 the Carmania was allowed to return to Cunard and, after being refitted, was employed largely on trooping duties between Halifax and Liverpool. After the end of the war it was engaged in the repatriation of Canadian troops. "At the beginning of 1920 it was completely reconditioned and returned to the Liverpool to New York service. In 1923 the passenger accommodation was altered to allow for 425 cabin class, 365 tourist class and 650 3rd class passengers. Despite being involved in several minor collisions the rest of the Carmania's career was relatively uneventful. Like its sister ship it was employed on short cruises in the winter months. By 1931 the ship had become outdated and overshadowed by more modern vessels, and in March 1932 the Carmania was sold to Hughes Bocklow & Co. and scrapped at Blyth." Carmania: Three days after war was declared, Carmania was converted into a armoured merchant cruiser. Both her and her sister ship, the Caronia were armed with 4.7 inch guns. In mid-September 1914 she sunk the German liner Cap Trafalgar. The Carmania was going to help at Gallipoli but she ran aground on the way and ended up just picking up survivors from three battleships torpedoed in the Dardanelles. The Carmania was the first Cunard liner to have turbines.